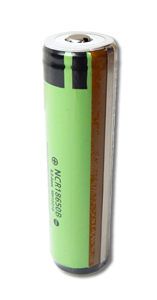 Lithium 18650 rechargeable battery, 3.7 V 3400 mAh. 12Wh, Button Top, PCB Protected NCR18650B) - UN38.3 Passed. 19mm x 69mm or 0.748" x 2.716"